Between 2011 and 2013, Exoma Energy operated an extensive exploration program in the Galilee Joint Venture exploration permits (ATP 991P, ATP 996P, ATP 999P, ATP 1005P and ATP 1008P), which tested for CSG, shale oil/ gas and conventional oil plays. This program did not identify a commercial hydrocarbon resource. Based on its analysis of technical results, Exoma considers that further exploration of the Galilee Joint Venture acreage is inappropriately risky for a small company and does not support further investment of the Company's resources. 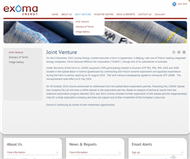 As such, Exoma has elected to withdraw from the Joint Venture rather than participate in any further exploration. 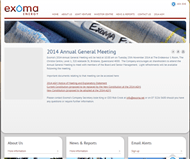 Exoma will continue as operator until a date early in 2015, to be confirmed. 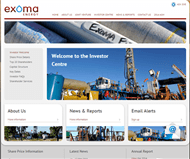 Exoma is continuing its review of new investment opportunities. On the 8 December 2010, Exoma Energy Limited executed a Farm-in Agreement, in Beijing, with one of China's leading integrated energy companies, China National Offshore Oil Corporation ("CNOOC"), though one of its subsidiaries in Australia. Under the terms of the Farm-in, CNOOC acquired a 50% participating interest in Exoma's ATP 991, 996, 999, 1005 and 1008 located in the Galilee Basin in Central Queensland by contributing $50 million towards exploration and appraisal expenditure during the Farm-in period, expiring on 31 August 2013. The Joint Venture subsequently agreed to relinquish ATP 1008P. The relinquishment took effect on 8 May 2014. 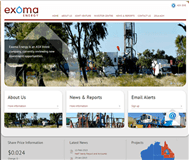 On 30 October 2014, Exoma announced its withdrawal from the Galilee Basin exploration permits. Following this, CNOOC Galilee Gas Company Pty Ltd will have a 100% interest in the exploration permits. Based on analysis of technical results from the extensive exploration program between 2011 and 2013, Exoma considers further exploration of the Galilee permits inappropriately risky for a small exploration company and does not support any further investment of the Company's resources.